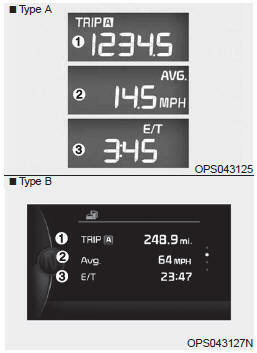 The tripmeter is the total driving distance since the last tripmeter reset. To reset the tripmeter, press the RESET/ button on the steering wheel for more than 1 second when the tripmeter is displayed. The average vehicle speed is calculated by the total driving distance and driving time since the last average vehicle speed reset. To reset the average vehicle speed, press the RESET/ button on the steering wheel for more than 1 second when the average vehicle speed is displayed. The average vehicle speed is not displayed if the driving distance is less than 0.03 miles (50 meters) or the driving time is less than 10 seconds since the ignition switch or Engine Start/Stop button is turned to ON. Even if the vehicle is not in motion, the average vehicle speed keeps going while the engine is running. The elapsed time is the total driving time since the last elapsed time reset. To reset the elapsed time, press the RESET/ button on the steering wheel for more than 1 second when the elapsed time is displayed. Even if the vehicle is not in motion, the elapsed time keeps going while the engine is running.